Murph (Co. Galway): Well what to say, I have never seen him play and only read the stories but how do you describe him in a few words. Yep, that sums it up for me. Stephen Thornton: Congratulations on receiving this award, thoroughly deserved. Wish I'd had the chance to see you play as you are revered by so many. Andy Brown (badbear): Congratulations Jimmy. I never actually got to see you in the claret and blue but having talked to you and heard the stories from parents and friends it's a well deserved honour. I know you will be saying the all team deserve it not just me because that's the type of guy you are a true gent. Brian Sagar: I last saw Jimmy McIlroy as we both walked towards the Turf in time for the match when all the ex Clarets were coming to pay their respects/tribute to Brian Miller shortly after his untimely death. I just said something like "Hello! sad day eh?" and told Mr Mac how big Dusty and me played football together in Hapton as kids and went on the same train to school. He listened and we agreed that Brian was one of the good guys. We shook hands, and went our different ways into the ground, and I just felt so proud. Jimmy Mac looked fit enough to still play ball. He was our hero, great to watch, and whenever you think about him you also think "If only he still did play for us". But most importantly he is a really nice man, and I really hope he enjoys his big day. Brian Sellers: Thanks Jimmy for wonderful memories of a fantastic era for Burnley Football Club. You are a true ambassador for the club and your honour is richly deserved. I was very fortunate enough to see you in action during the late 50's and until your departure to Stoke in '63. It is hard to put into words what you and the team meant to the supporters of Burnley Football Club during those vintage years of League Champions, FA Cup finalists and wonderful European evenings on the Turf. Probably the best example I can give relates to my father who was a lifelong Burnley fan. When he heard the news of your departure he was so incensed, upset and shocked, he vowed never to pass through a Turf Moor turnstile again and, despite my best efforts during the 'Adamson era' he kept to his word. Jimmy, you leave many lasting memories of how the 'wonderful game' should be played. I can still vividly recall you with the ball at your feet by the opposition corner flag surrounded by 2, 3 or even 4 defenders. Moments later, following a shimmy or two and magic footwork you would be bearing down on goal, leaving the defenders in your wake. Then there was the penalty taking where you almost seemed to mesmerise the opposition goalkeeper, like a rabbit trapped in car headlights. Three or four steps up to the ball, a sway of the hips to leave the keeper rooted to his spot and you would stroke the ball into the bottom corner of the net. Absolutely brilliant. Thanks Jimmy and enjoy your day. Dale Scott: I was 16 when I first began following Burnley coming over from Bradford.Jimmy McIlroy was my boyhood hero. In those days you could buy rubber stick on soles to mend your shoes, and I had McIlroy's name in nails in them for when I went to school.I was proud he was my idol. He was a classy player , always passing on the ground, as was - and still is - Burnley's style. To see him send Ray Pointer and John Connelly away with those beautiful through balls was a joy to behold. I went all over the north of England on my Lambretta scooter to see him and the rest of a wonderful Burnley team in the snow, rain and fog and was worth every mile. And I was there on the terraces at Maine Road to see us win the Championship. No young person could have had a better role model than gentleman Jim. The prima donnas of today aren't fit to tie his bootlaces. Thank you sir, and congratulations on your award. Howard Fothergill: Jimmy Mac my childhood hero. How I enjoyed watching him torment defences, a marvellous player in a very good team. They were great days and nights at Turf Moor with Jimmy Mac centre stage. He was and still is a credit to the club, a real gentleman and a thoroughly nice guy. God bless you Jimmy and thank you for all the pleasure you gave. Andy Woodward (Exmouth): Jimmy, I am thrilled to hear that you have been granted this much deserved honour. I was born the year we won the First division championship so I never saw you play for Burnley in anger (John Angus' testimonial apart) but my mum still talks about you. There is no doubt that you were a truly great player and from what I have seen and heard over the years a truly great man. I am sure that you are enjoying this season as much as the rest of us and lets hope we can end it in the promised land and that we can also see you arise Sir Jimmy with another long over due honour. Peter Brunskill: I had the privilege of meeting Jimmy on my first day at school almost 50 years ago and afterwards saw him play many times. Rosehill was a football mad school and we went though the traumas of his transfer together. Sadly his loss led to the subsequent decline of the club, yet throughout all Jimmy has remained a man of dignity and honour. He has forgotten more about football than most people ever knew, and continues to set the standard for today's Burnley players to emulate. There has never been a greater player in Claret and Blue and no finer person has ever worn the shirt. The honour of Freedom of Burnley is overdue and well deserved, just the knighthood to go now. John Rigby: Long overdue and much deserved of the Greatest Claret of them all!! Congratulations from a lifelong fan in Cape Town, South Africa. Shaun (irish_claret): Even though I never had the privilege to see you play, I encounter many occasions when it is clear to me that you are the embodiment of all that is great about Burnley Football Club. Wherever I travel in the world, the mention of Burnley Football Club always bring the same response... ah, Jimmy McIlroy. Alan Green of the BBC said the following in this week's "Irish Examiner", "......... it was terrific to be reminded of the Irish connection to the town for it was announced last week that Jimmy McIlroy is to be given the freedom of the borough. Jimmy, one of the nicest men I've ever met in football, is still beloved in Burnley. And it is true Jimmy, you are one of the nicest men in football and very much beloved of not just the town of Burnley but the whole Clarets' diaspora. Steven Heaton: Jimmy Mac - I never saw him play but I was fortunate enough to meet him several times. The most recent time was at the Supporters Groups Player of the Year Evening, I was even fortunate enough to be able to sit next to him. I found him to be such a gentleman, and a wonderful person. I only wish I had been fortunate enough to have been able to see him play. What a legend!! I hope you really enjoy your day. All the best. Steve Ashley: A fabulous footballer in his playing days and a true gentleman, an absolute pleasure to talk to nowadays. Jimmy McIlroy a Burnley legend on and off the pitch, an honour well deserved. Tony Armstrong: You continue to be an inspiration to the town. Very pleased for you and not before time !!! John Devitt: I wish to offer my personal congratulations to Jimmy McIlroy for the well deserved honour which is being bestowed on him this evening. I had the privilege of being a spectator at a number of matches during the late fifties and the championship year when Burnley were a really great team. At that time Chelsea were the subject of music hall jokes by the celebrity radio comedians. How times change and all because of TV and money ! I look back now and believe that Burnley supporters were truly spoilt in terms of the quality football entertainment which was put on by the Clarets then. The combination of the two Jimmies - McIlroy and Adamson was the brains and driving force for the team's success. They played with great vision and their ball skills and creativity would put to shame many of today's so called mega stars and overpaid prima donnas. I just hope that the current economic downturn brings some commonsense into the game and a level playing field where smaller clubs can compete on sporting merit instead of waving a cheque book. Daniel Fitton: Congratulations to a legendary player and a legendary gentleman! I am not old enough to have seen Jimmy in his playing days. However, like many fans of my age watching the TV footage of him terrorising defenses we can imagine the excitement he brought to the terraces of the turf. I have been lucky enough to meet Jimmy on a number of occasion as a lad when he was writing the sports articles for the paper. I was the Lowerhouse Cricket Club scorer and whether he came down to a game, or I called through the results, he was always a top man. Always friendly, always had a story to tell, and will ALWAYS be a Burnley legend. Gerard Bradley: Congratulations and thankyou for the memories. In my mind's eye I can still see you in the right wing corner of the cricket field end doing a shimmy and then bursting through past defenders to centre for someone to score. You have been a great, gentlemanly ambassador for the town and the club and long may that continue. Scott Atkinson: Jimmy, Jimmy, oh Jimmy Mac, when are you coming back! I wish I'd seen you play in the flesh, but I don't need to have to appreciate what a LEGEND you were and what an INSPIRATION you continue to be. Simon Chamberlain: Thank you for your fantastic contribution to our town and football club over the years. You will always be a legend and deserve the highest accolades. Arthur Leeming: CONGRATULATIONS JIMMY on your award of freedom of the borough. I never saw you play having started watching the clarets in 1966. You will go down in history as THE GREATEST Burnley player of all time . Enjoy your night on Tuesday - lets hope its a Clarets victory for you. Tim Redman: Well done Jimmy. I was born 8 years after Jimmy last played for the clarets so obviously never saw him play but there has never been any doubt in my mind that Jimmy Mac is the greatest claret of them all. 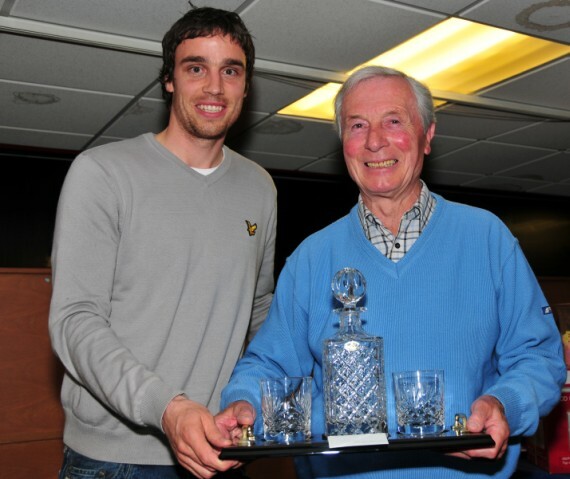 Gareth Lane (ClaretGaz): Many congratulations Jimmy on a fantastic achievement that you thoroughly deserve. Unfortunately I'm not old enough to have witnessed your talents but have heard many great stories from my dad about how special you were. I was even at a wedding once and got talking to Ronnie Clayton who described you as his toughest opponent! Dave Alty: I have supported and watched Burnley since being a young teenager way back in 1958. I was very fortunate to have seen most of the home games in the Championship winning season. Like a lot of the young fans my favourite player was Ray Pointer, however the outstanding player of a brilliant side was the inside-right Jimmy McIlroy. He was superb and an absolute joy to watch. Jimmy still lives in the town and can be seen at home games in the James Hargreaves Stand. My congratulations and best wishes to Jimmy Mac on receiving this great honour by the Borough of Burnley. Very well deserved. David Couch: Congratulations Jimmy - very well deserved. I am 66 yrs old now and watched you throughout your career. There is no one who has played for the Clarets who has given me more pleasure. With best wishes for your health and future. Les Leaver: Have a great day Jimmy Mac you deserve this accolade for all you have done for this proud and great club. I am a follower of 43 years but now live in Florida so I don't get to games now I listen and watch when ever I can an I am excited about this year. Phil Richardson: You gave me such pleasure with your delightful skills. This award to you today is well and truly deserved. You are as ever a gentleman. Bernard Daley: Congratulations Jimmy. The best Burnley footballer ever and a true gentleman. Whenever I have passed you in the street to say hello, as a child in the 60s or as an adult, you have always been gracious enough to return the complement even though you have no idea who I am. You are a very, very nice man. John Lingard: 29th August 1959 was my first visit to Turf Moor, the start of a lifetime sentence. In those days Burnley had a good following in Littleborough and to a 14 year old this was growing up. Turf Moor was a sea of green with little claret and blue on display. The pitch was a lush green for the only time in the season, soon to turn brown and muddy as autumn rains took hold; the stands were painted green as were the spectator barriers and fences of the Longside. Out there on the pitch the finest XI to don the claret and blue was taken apart by a modest West Ham. We lost 1-3 after an early John Connelly strike cutting in from the right wing at the Beehole End. The West Ham fullbacks ominously included one John Bond! However that day I fell in love and was hooked by the Burnley number 8 - Jimmy Mac. What a player! The finest to ever grace the Turf without doubt. Deceptively fast, an incisive finisher when he wanted to be, master of the slowly struck penalty after sending the keeper (Springett) the wrong way, the original short-corner maestro, Mac had it all. Often with thigh heavily bandaged he took teams apart and I well remember him roasting England fullback Don Howe of West Brom when injury forced him to take berth on the right wing. His many excellent performances over the years are too numerous to recall. In that fine championship winning side of 1960, Mac, along with Jimmy Adamson, was both the creative engine and "icing on the cake". We were all amazed and mightily distressed when Bob Lord butchered him in his prime and sold him to Stoke. Why? What for? Since then Jimmy McIlroy, an Ulsterman, has led a mature and dignified life within the town he now calls home. It is most fitting that Burnley is finally honouring and recognising its finest son. A true gentleman, Jimmy Mac, we salute you! Bob Clegg: I was fortunate to watch the great man play in his hey days for Burnley and Northern Ireland. I will never forget the feeling I had when I found out he had been transferred to Stoke. This was my worst moment in football. However the great man still goes to Burnley and must be pleased with the way we are playing now. Congratulations on your award. It should have come sooner. Martin Dempsey: Many many thanks for signing what is probably one of my prized possessions, that is, 'Right inside football' the copy of your own book published by the sportsman's book club in 1962.This really is a fascinating and wonderful insight into the game and how it was to progress and change. Your influence goes without say at BFC but this is well worth a read by anyone seriously interested in the game. All the very best and much deserved recognition from all Clarets everywhere. Bryden Holden: One of the greatest footballers to ever grace the hallowed ground of Turf Moor and a true gentleman as well. Congratulations Jimmy on an honour you most definitely deserve and one you should have received a lot earlier in your life. Enjoy the day and know all Clarets think this award is fully justified and that you deserve it. HERO! HERO! HERO! David Baxter: We used to sing the following song to acclaim the mesmerising Irish magician. All the team's a better team thanks to McIlroy. And so say all of us. Congratulations. HolyCustard: Jimmy McIlroy, a true Burnley legend and fully deserves his special day. Best wishes and all the very best. George & Susan Grimshaw: Jimmy, you have been a credit to our football club and to our town. Your name will be spoken for many more years to come and rightly so. You were born too early to "enjoy" the mega bucks earned by today's players, but none of these current stars can hold a candle to you as a gentleman and role model you will be unequalled. Lee & Brooklyn Cross: As a Burnley fan of 36 years of age I never had the chance to see "Jimmy Mac" play and my dad was only 10 when he left Burnley. Speaking to some of the older fans and reading books I can only imagine what a player he must have been back then and how he would have been if he was born in this era with better pitches, equipment and fitness levels. Funny thing how so many ex-players have still stayed in the area after they stop playing the game either with Burnley or come back from another team. All the best and well deserved to a great player on and off the field. Chris Bradley: A class act and the best Burnley player in my lifetime. Anth Pearson: You were my first hero. Whenever I recite my 'best ever Burnley eleven', "Jimmy Mac" is always first on the list. It's you I build my team around It's because of you that I still support Burnley 50 years later. Thanks for all the memories. Tony Lee: I have supported Burnley since I was a little lad (I was born in the town but moved away when I was six). To me Jimmy Mac certainly was the greatest player to wear the claret shirt and it was a privilege to see him play, unfortunately only in away matches in the London area. I remember particularly the superb match at Tottenham, Spurs 4 Burnley 4. A tremendous match with marvellous players on both sides. Jimmy, you were my idol - and you still are. Many congratulations - if anyone deserves the freedom of the town, you do. Pete Ellis: I would just like to convey my very best wishes to arguably the best player to ever pull on a CLARET shirt. I witnessed some of his sublime skill for real and it just left you speechless, there wasn't anything he couldn't do with a football, and the pleasure he gave us Burnley supporters was immense. So God bless and all the very best Jimmy Mac, it's the very least you deserve and thank you. Joe Nick: Many congratulations Jimmy, I've been following the Clarets for 50 years, and you're, 'without question', the best Burnley player I've ever seen. Thanks for all the great entertainment and I hope you'll enjoy tonight's game, because this is one of the best Burnley sides for a long time, playing the kind of football that, I know, you'll appreciate. Keith Nuttall: Not before time for Jimmy Mac, the very best Burnley player to ever wear the claret and blue shirt. Jeff Nutter: Thanks for many hours of wonderful memories. I can still see you taking short corners, dragging defenders out, nutmegging them and then crossing for others to score. Football has never been the same since. For me you were the best footballer ever. Many congratulations on your latest honour. Brian Dobney: I watched you as a kid Jimmy...you were brilliant. Still got your autograph that my dad got for me when I was about 11. (I'm 57 now). We all mourned when you were sold. I worked alongside you somewhat (was in Circulation) in your newspaper days. You deserve your award. Congratulations Mr. Mac. I could say much more. Mark Leach: Good luck Jimmy and Well Done. I was born in 63 but through my formative years I heard wonderous stories of your skill and ability from my Great Grand parents, Grand parents and my Mum. It's great you have been honoured in this fashion. I though you got the Freedom of the Town the night we played Hamburg at the Turf. David Wilkinson: "Mac the knife" would slice through any defence. Faithful to theTurf through and through. Shabbily treated at the end. He often played carrying an injury but was still magic. Time after time he would cut through a defence to reach that dead ball line to feed superb crosses into the box. A legend but modest. Magical memories!! Congratulations and good health. Best Wishes for the future. Have a great day. Michael Timberlake: I have been a lifelong supporter of Burnley Football Club and watched my first game in 1958, when Burnley F.C. were one of the top teams in the country. During those fifty years I have purchased many replica Burnley shirts but the 'replica shirt' I most remember is the first one I received from my grandfather as a Christmas present about fifty years ago. That shirt had a number eight on the back because the number eight shirt in the Burnley team was worn by my favourite player Jimmy McIlroy !! It was a pleasure to watch you play in those days and it has been a pleasure to meet you on several occasions since then. Congratulations on receiving the Freedom of the Borough. a thoroughly deserved accolade for the best player in the history of Burnley Football Club. P.S. My father was one of the many supporters who refused to visit Turf Moor again after Jimmy McIlroy had been sold to Stoke City in the early sixties!! Les: Hope you enjoy your day and many more of them. I am one of the fortunate few left perhaps who saw you play many times and queued up for your autograph after the game. I can remember that you would only sign once settled in your car (possibly a Singer Gazelle or similar) and only if we formed an orderly queue around the car. The secret was t find out where you had parked it. Once again congratulations and enjoy. Patrick & Barbara Spencer: On a Tuesday evening in August, 1957 my cousin and I were taken on a Wildes coach trip from Barnoldswick to watch Burnley play Preston at Turf Moor. That night we were treated to an exceptional exhibition of high quality football orchestrated by the Burnley inside right Jimmy McIlroy, and from that game we became dedicated lifelong Clarets. For the ensuing five or so years we were privileged to witness and marvel at his outstanding football skills, where he was able to totally dictate and control the pace and direction of each game utilising his unquestionable vision. Whilst Adamson was organising his solid defence it was McIlroy who was the genius and creator for the Robson and Pointer goals, which came in abundance. Without a doubt, the wizardry and flair provided by McIlroy was the catalyst for making Burnley into the best club in the land and the envy of all other teams. In over a half a century of watching football I place Jimmy McIlroy alongside the two other outstanding players I have been lucky enough to watch ie. Tom Finney and George Best. Jimmy McIlroy is probably the greatest player to wear the claret and blue of Burnley and furthermore he is the Club's finest ambassador. An unquestionable legend. Alan Bolton: A worthy honour for a real gentleman and a great footballer. Anthony McNee: Well done Jimmy , have a great day and evening. I've seen some good players (and bad!!!) in my time supporting Burnley, the only regret I have is not seeing you play. I'm sure you would have walked into this current Burnley side!!! Tony Levine: As a Burnley supporter living in London I had the privilege of seeing you play against the Capital's teams in the First Division and, of course, the Wembley Final. The team you played in (late 50's early 60's) was a great one containing many international representatives but for me you were the guile and the midfield skill; the play-maker, the heart of the team. You are always remembered and admired. Dermot Martin: To Sir Jimmy. Long overdue. Pride of Burnley and pride of Belfast. Clive Leah: Congratulations and good luck for the future. As a young boy growing up in the Rosehill area of Burnley in the 1950s we were privileged to have quite a few Clarets stars around us and I remember that you lived on the road opposite Rosehill school. As I recall there was a little park at the bottom of Moorland Road/Reynolds Street where we used to play football and I vividly remember you joining in for a while one day. Ray Pointer and Jimmy Robson often did...much to the disgust of the "Parky ". Those happy days are indelibly etched in my memory and I distinctly remember the adulation for you of my father (now 95 ) who still talks fondly of "Jimmy Mac " and who never went to Turf Moor again after you were transferred. As I too get older those happy days become more important and I thank you for your huge part in formulating those wonderful memories. Abs Orton: I'm an ex Rawtenstall lad only 3 years younger than you. I left the area in'57 for a whole career in the Royal Navy. You and your fellow team mates, Adamson, Pilkington, etc (not forgetting Mr Jock Winton) proved and inspiration to me as a schoolboy, and as an adult. Congratulations on your special day, and thank you for your amazing talent and dedication to our team and the game. Derek: Jimmy Mac, not only a great football player, a great man too. Good luck Jimmy, you gave me many hours of pleasure watching you from the terraces and on the training ground in the hay days of the clarets when I was a junior player at the club. Tom O'Brien: I would like to congratulate Jimmy McIlroy on his latest honour and it goes without saying that this is long overdue. I spent many hours at Turf Moor as a schoolboy notably. I was privileged to start supporting Burnley in 1959 when Jimmy used to come along to St James the Less school in Rawtenstall and coach us every Tuesday (come rain, snow or whatever). Jimmy was and still is a gentleman and deserves all the accolades he is receiving. Mick Simmons: Congratulations Sir Jimmy you well and truly deserve this recognition. It is well overdue. Dave Thomas: When Burnley 'lost' the title which was within their grasp at the end of season 61/62 it was the result of winning just one game out of the last ten. Up to then we were a dazzling football side, and had scored 90 goals already. What is seldom mentioned is that of those last ten stuttering games, Jimmy Mac missed five of them with injury. If only... the two biggest words in football. It is reasonable to suppose that if only he had been fit during those last games, another title would have come Burnley's way. That's how important he was. Jimmy Mac - my boyhood hero. Roger Cunliffe: Congratulations - A fitting tribute to a talented star. Mike Sagar: Congratulations Jimmy, you deserve it. You were my hero as a young kid in my formative years watching the Clarets. You were the reason I followed Stoke when you left, and you are the reason why I returned to the fold, just as you have. I'll be standing up at half time giving you one hell of a cheer. Chris Redman: It is not possible to describe the sheer joy and privilege of watching the Clarets football in the late 50's and early 60's. Jimmy was of course the catalyst, sheer genius, his skill often defied belief, as you often couldn't believe what you were seeing! But more than that Jimmy is still as ever, a wonderful, shy, unassuming perfect Irish gentleman, and he so richly deserves this accolade which his adopted town is bestowing. Thank you Jimmy for what you have brought into my life and the lives of so many. Andrew Nixon: To the greatest Claret of them all. On this very special day, I would like to wish Jimmy Mac all the best and to thank him for his efforts in the Claret and Blue. I saw you play for the Clarets for many years and you were the best without any doubt. In fact, you were so good that you overshadowed so many other excellent Burnley players. Thank you for the exciting play. Thank you for the memories. Thank you for staying so loyal to our fabulous club and the town. It's been a pleasure ! Roy Asten: Congratulations Jimmy, you more than deserve this honour, I am old enough to have watched you play in the 50s. There was never a more accomplished, midfielder, ever to grace Turf Moor. Ian Gregory: Congratulations on your special day. You were the undoubtedly the star of a team that brought success to the club which fans from the 70's onwards can only dream of. Should my generation of supporters (now in my 40's!) be able to pick one player from the list of Burnley greats who we regret never having seen play "live", I'm sure you'd be top of the list for 99% of them. Phil Sagar: With the exception of in my opinion George Best the greatest footballer of all time our Jimmy would be the greatest Irishman ever to play the beautiful game. David Lancaster: I was 12 years old at the time when Burnley won the first division title. Needless to say, Jimmy McIlroy was my favourite player. And "Right Inside Soccer" still has pride of place on my bookshelf. Many people have spoken about Jimmy as a person as well as a footballer. That echoes for me. When I was about 10 or 11, and living in Nelson, I was visiting my uncle, who lived near the McIlroy's house in Rosehill. My uncle pointed out Jimmy's house. I said I'd like to get Jimmy's autograph but my uncle said I shouldn't disturb him in his home. But the next time I was in Rosehill (and not with my uncle) I did knock on the door. I'm amazed in retrospect about the politeness with which Jimmy addressed this young lad (me) and gave me his autograph, instead of telling me not to disturb him at home. Not only a great footballer, but also a gentleman. Ian McLennan: I first became a Burnley fan, aged nine, after the FA Cup final defeat to Spurs. In my school (in Reading), I was known as the Burnley fan. Charles Buchan's Football monthly and newspaper articles about Burnley FC, were my food and drink. One man stood out then and when he left, I cried (no one knows that, so shhh!). I cannot begin to describe my turmoil at that time - probably, my first bereavement experience. Wherever I go now and football is talked about, everyone my age knows of the Burnley team of the time and happily reel off their names - and they are not Burnley fans. They also single out one man for a special mention. Congratulations and thank you Jimmy 'Burnley' McIlroy. One and the same thing to many and now it is official! Phil Sagar: My father is in hospital and not very well, and when we sit and talk about our love for Burnley Football Club one player puts a twinkle in his eye. You sir. John Woolley: A marvellous footballer and a pure gentleman. I am lucky enough to be old enough to see him from when I was six in 1958 till when Jimmy left in 1963. He was a key man in an excellent team. He could dribble past anybody and was an excellent penalty taker to mention just two aspects of his play. I remember him once tormenting Alan Hodgkinson of Sheffield United - Hodgkinson seemed to be diving all over the place on the goal line and all Jimmy was doing was standing over the ball on the penalty spot just wiggling his hips. I met him once or twice coming home from Rosehill - always the kindest of individuals. I won't be at the match tonight. I hope you have a lovely evening and are able to celebrate it watching a team play some of the football nearly up to the standard of that set by yourself in those bygone years. Mark (DingleDangle): Congratulations Jimmy on being given the Freedom of Burnley. Richly deserved and very long overdue. Gary Ingham: Although I was born in 1966 I obviously didn't see you play, but thanks to my father and grandfather and the magic of television I have realised what a great player and a legend you are. You are quite rightly deserving of this award. You opened a Christmas fair on Sunday where you asked my 3 year old son if he supported Burnley. When we got home I told him all about you and when he grows up he will know just who spoke to him when he was at that Christmas fair. PS thanks for the autograph Jimmy. Gary Jenkins: Congratulations Jimmy on your achievement. Unfortunately I wasn't old enough to see you play, but my Dad always spoke about what a superb player you were for us, and that you were the greatest player to ever wear the claret and blue jersey. Having met you several times at your home, I would just like to say what a down to earth person you are, who always has time to speak to the fans and sign autographs, and I wish you all the best for the future. Mark Williams: Congratulations on a long overdue honour, Jimmy. Like many, I am of an era that never had the privilege to witness the great team of the late 50s and early 60s, so have to make do with tales from parents, late grandparents and more senior Clarets fans that I know. One thing that remains constant in the tales of this era, is that not one of them has ever said anything less than you were the greatest player they have ever seen play for Burnley. I had the honour of meeting you in the mid 90s when I worked at the club for a few years, had a chat and you autographed a programme for someone I knew. The thing I can vouch for first hand, is that you are a true gentleman. May you enjoy many more years watching the Clarets and hoping that success comes our way once again. Mike Davies: The joy of reaching 65 is 3 fold. I watched and can still remember England winning the World Cup, Burnley beating City in1960 and watching Jimmy Mac from when he first played for us, even watching him score for Stoke against Newcastle when they were thrashed 5-2 in 1963. My best memory was in 1959-60 when an injured Mac played on the wing against WBA with his right arm strapped to his side making one if not the two goals that gave us a 2-1 win after being 1-0 down. Thanks for the wonderful memories and well done. It should be the freedom of Lancashire. Newell Thornton (Toronto): I was a juvenile season ticket holder at Turf Moor back in the 60's and stood on the terraces on a stool my father made for me to watch Jimmy McIlroy demonstrate his truly amazing footballing skills. I still remember the thrill of watching him knife through those defences. I was also standing on my stool to watch him at Wembley in the 1962 cup final. I feel privileged to have seen Jimmy play so many times and heartily endorse this recognition of a great gentleman and footballer.